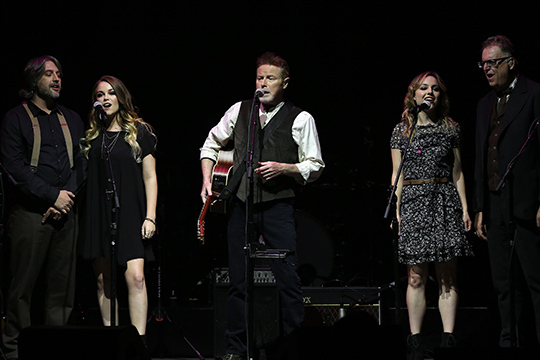 A co-founder of the super group the Eagles, Don Henley has also established a long solo career, then he re-established the Eagles, and now he has a new solo album. I'm tired just writing that down. But Henley's boyish manner and southern charm, at 68, shows little sign of letting up as he easily delighted the near sell out crowd at the LA Forum last Friday night. He's as easy on stage as if he were sitting across a table from you having a cup of coffee and telling a funny story he heard from back home. Henley is touring with his first solo album in 15 years, Cass County, named for the northeastern Texas county in which he was raised. He called it a tribute to where he came from. "I love Texas, he said. "Just not the politics. Or June or July." "The album came out last week at number 1," he said politely, and after the cheers died down he continued "Ladies and gentlemen, at this stage of the game you don't know what a miracle that is. Thank you." Cass County is Henley's first career solo album number 1, appearing on both the national and country Billboard charts. Henley is one of the old guard, an O.G. of rock and roll, who's brilliant writing and musicality established The Eagles early on in the pantheon of 70s rock super groups. Songs like "Lyin' Eyes" and "Life In The Fast Lane" showed his wit and sharp penned lyrics were unforgettable. His solo career in the 80s and 90s with hits such as "New York Minute" and "Dirty Laundry", both of which he played live, showed his open hearted ability to write about loss, the broken heart and hope. Opening with a nine voice a capella ballad, 'Seven Bridges Road', certainly got everyone's attention as it was an early Eagles favorite in concert. But Henley made it clear the evening was about his own unique music choices, both off his new album and others that inspired him. "We're going to play you new songs, and some from the 80s and 90s, a little bit of everything. I don't like to live a monochromatic life, I like Arugula, and Pink's hot dogs," he said to laughter. At this point in his life it's possible he's spent more years on stage than off, and his ever relaxed manner speaking to the audience between almost every song clearly showed it. The screams "I love you Don!' came ever present through the evening. At one point he looked up smiling and said:"I know, it's exciting, isn't it?" When a fan kept yelling "Eagles" he finally said "No, Dude. I just finished 21 years of that!" Henley did 10 songs from his new album. The music sounds rich and full of life, part Country, part Americana, with somber ballads and friskier romps that shift through melancholy to contemplative, to courtship and others that can still sting. Henley's never been afraid to show you his broken heart, or slap you in the head for a mis-step. Both sides of him are on the album. "Take A Picture" is a heart breaking song about leaving a marriage after the children have grown. "Old Flame" about the (real) ex-girlfriend who reaches out after decades for closure, but only brings back bad memories. He wouldn't tell us who she was, just said "There's a dark side to the internet, people can find you. This old girlfriend, it's all cool now, we're cool, but it ended badly. She reached out to a friend of mine and he said "sure, he'd love to hear from you!' And he gave her my email. Thanks friend." 'Praying For Rain' brings an aching melodic prayer seeking to ease a drought (real or allegorical), and 'The Cost Of Living', has a classic Henley hook describing life's obstacles; "It's the cost of living...and everyone pays." Henley co-writes 10 songs on the album with friend and lyricist Stan Lynch. When playing his new songs on Friday and you couldn't help but marvel at not just at how good he sounds, but at how well crafted the songs are. His ten member band and vocalists brought great musicianship. Two of the three back up singers, Erica Swindell, Lara Johnston and Lily Elise, were graduates of the Thorton Schol of Music at USC and Henley made a point to say "See, they're not just pretty faces, but they have the paper!" Erica Swindell showed she could bring down the house on her own with full throated sorrowful vocals on the duet 'When I Stop Dreaming', and Lara Johnston received her own applause for her part in the duet 'Words Can Break Your Heart'. Henley famously has had his highs and lows, and now has made peace with it all. His new song "Where I Am Now," makes the point. He ended the evening with that one saying; "It's how I feel about life, and I hope you do to." Having listened to his new album three times already, I can tell you the music has the haunting tug that pulls you back again. Henley is a master composer who makes you feel like his songs have always been there, somehow, in your memory, just waiting to come out. Henley was very supportive and friendly with his band, always giving credit and thanks as they each stood out, solos from guitarist Steuart Smith and steel guitarist Milo Deering were notable, as well as the drummer Scott Crago and keyboardist Will Hollis. Covers of a few favorites of his, "I Put A Spell On You,' by Screamin' Jay Hawkins, and Randy Newman's "Let's Burn Down The Cornfield" were punched by the seven piece horn section. Perhaps Henley's more comfortable on stage than off, based on the unresolved tension in his songs, but that's the artist's role, to take what we all find so difficult in life, and make it beautiful so we can all look it in the face and make our own peace with it. Henley gave a two and half hour concert, unusual in length as newer bands frequently do 75 minutes sets. But that's what you get when an O.G. of rock and roll shows up. It was not just a nostalgic trip (as decades of work by artist's like Henley score our lives,) but also a celebration of his new work which shows he has no thoughts of slowing down. He's going to keep sharing his thoughts on the world the way he sees it. Lucky us. For more on Cass County. For more on Daniel Gluskoter photography. Like the work? Follow me on Twitter and hit 'become a fan next to my name up top and receive notifications.